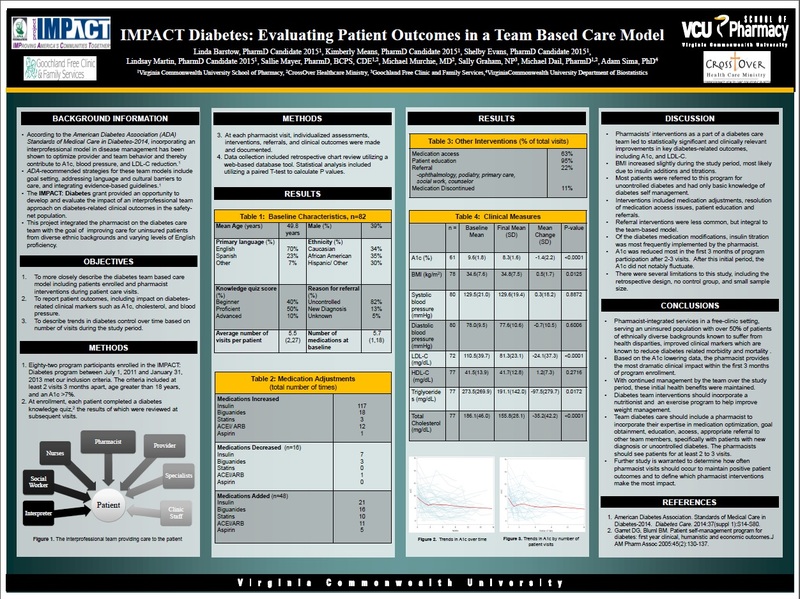 This interactive presentation shared how VCU School of Pharmacy, Goochland Free Clinic and Family Services, and CrossOver Healthcare Ministry collaborated to develop and implement a pharmacist-integrated team-based diabetes care model through Project IMPACT: Diabetes. Clinical outcomes data, and specific information on the model and tools utilized to implement the program within the inner city and rural free clinics were also presented. Participants learned ways to overcome challenges in implementing team-based diabetes care and ways to succeed in gaining funding to establish and sustain the program. Attendees showed interest in learning how to collaborate with pharmacists in their settings, especially those not near a major city or academic institution. Several free clinic nurses and staff requested further details about the diabetes program. The purpose of the presentation was to share how the incorporation of a pharmacist into the diabetes care team in a free clinic safety net setting resulted in better health outcomes. 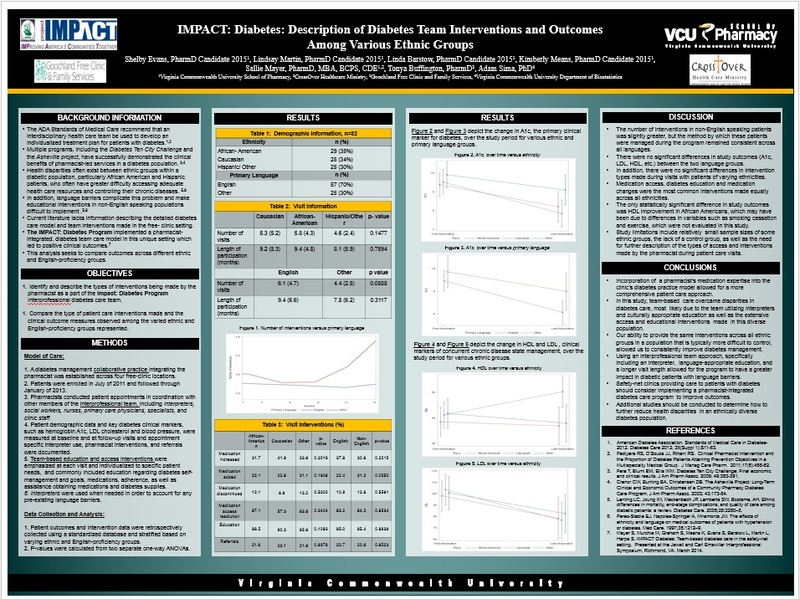 Presenters identified and described the types of interventions made by the pharmacist as part of Project IMPACT Diabetes at four free-clinic sites in Richmond, VA. In addition, they compared the type of patient care interventions made and the clinical outcome measures observed among the varied ethnic and English-proficiency groups represented. This showed that the types of interventions made were consistent regardless of a patient's primary language and clinical outcomes were not different among various ethnic groups. The presentation was an opportunity to explain the importance of having a pharmacist on a diabetes management team. It reached a broad audience of physicians, nurses, students and administrators to advocate for more pharmacist-led interventions in diabetic populations, specifically within safety-net settings.Many of the attendees could relate to the presentation in some way and asked questions about how such positive clinical outcomes were achieved.